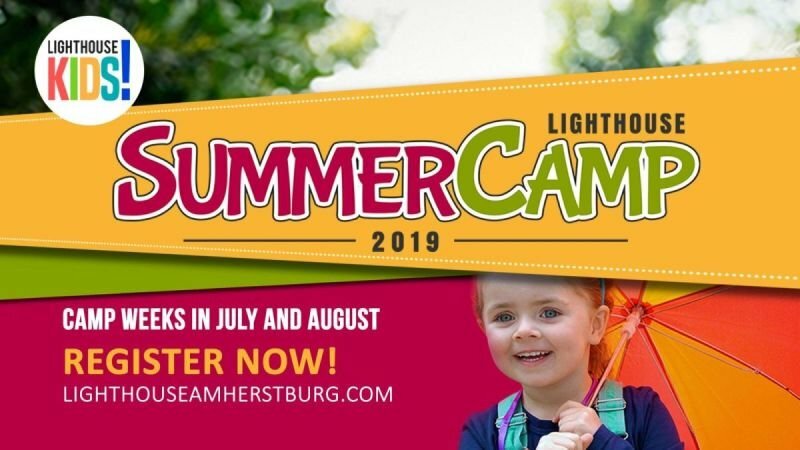 Kid's Summer Day Camp - Lighthouse Church, Amherstburg, Ontario. Registration is now open! Click HERE to register now! Partial weeks (July & August Holiday) - $60/week each for first 2 children in family; third child is half price ($30/wk); fourth and remaining children in IMMEDIATE family are FREE. FULL weeks - $75/week each for first 2 children in family; third child is half price ($40); fourth and remaining children in IMMEDIATE family are FREE. Camp fees include camp tshirt; 2 hot lunches (hot dog/grilled cheese Wednesdays & Pizza Fridays); 2 snacks per day and all activities including weekly field trips. Camp runs from 9am to 3:30pm each day. Early drop off (8am) and late pick up (4:30pm) are available for $8/child OR $15/family for either or both options. We have limited openings, space is reserved on a first come basis. All children beginning JK in September to grade 6 are welcome. Students in grade 7 & 8 may register as a "Jr Assistant" in Training". High School students may apply to volunteer at camp for Community Hours, lots of fun and great experience.